Use the navigation above to revisit Parts 1 & 2 of this important gas water heater maintenance procedure. The anode rod purpose is to prolong the life of the water heater’s glass lined tank. While protecting the tank from corrosion the rod deteriorates. It’s performance and the life span depend on the water conditions in your area, which will influence the time intervals for the anode rod’s evaluation, and replacement if such is required. Therefore, my suggestion is to have a professional performing at least the first time evaluation of the water heater’s sacrificial anode rod. The plumber will be able to show you what tool would be the best to remove it (1 1/16″ socket wrench in most cases), how to determine the remaining life span of the rod, and hopefully come up with a time frame for the next check-up. Water heater maintenance 3 – Tank water heater sacrificial anode rod access. 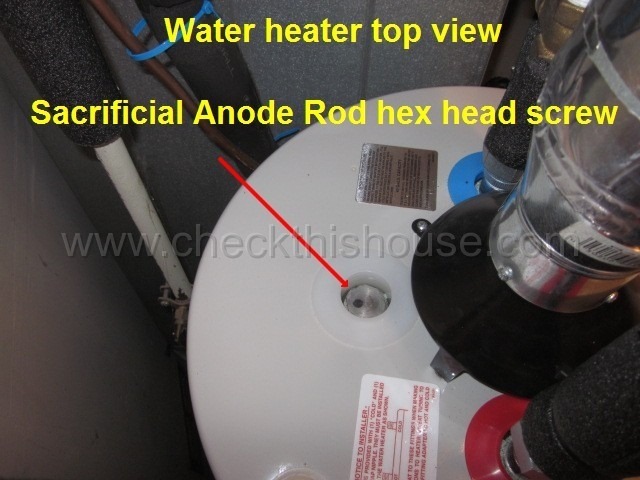 In most residential tank type water heaters it is fairly simple to locate the anode hex head screw on top of the appliance’s enclosure. However, in some water heater tanks this access might be obscured and without information about a particular appliance design and extra tools you may not be able to find it – get a plumber. Carefully (to prevent it from breaking apart if severely deteriorated) pull the anode rod from the water heater’s tank and depending on its condition: clean it or replace it with a new one. I’ll try to get some pictures for you so you know what to expect. Completely removing the anode rod from the water heater’s tank (except for inspection and/or replacement) will void the warranty and shorten the life span of the glass lined tank. Whenever your water heater is to remain unused for an extended period of time, you can save money and energy by simply turning off the gas, power supply (in some models), and water feed to the appliance. This will also prevent a build-up of dangerous hydrogen gas. been used for some period of time, usually more than 2 weeks. HYDROGEN GAS IS EXTREMELY FLAMMABLE!! To safely disperse such gas and minimize risk of injury, open the kitchen hot water faucet for several minutes prior to operating any of the electrical appliances that might be connected to the hot water system. Refrain from smoking or using an open flame near the faucet. A typical hydrogen confirmation presence is a sound of air escaping through the open faucet as the water begins to flow. Water heater maintenance 3 – Planning to leave your house completely unattended during the winter / concerned about freezing? Consider draining the tank water heater and piping if they might be subjected to freezing temperatures. If it’s a long shut-down period, have a professional check your water heater’s operation. If you decide doing it on your own, make sure the water heater is re- filled completely prior to starting its heating cycle. If you turn off the water to your property and properly drain / air blow the entire system, you don’t have to worry about freezing, cracking pipes, and flooding. 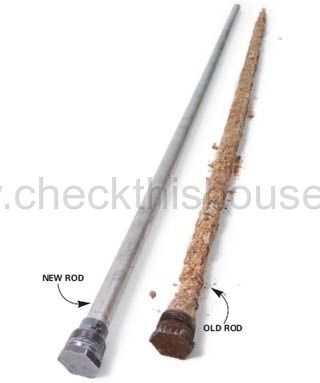 Anode rod helps to protect water heater’s tank from corroding but only while filled with water. Even its interior walls are glass-like ceramic coated, its rust-resistance will be compromised when empty. Gas water heaters require oxygen from air to burn its fuel (gas or oil), which is called a combustion process. Consequently, this air required for water heater’s combustion is called “combustion air”. An insufficient amount of combustion air supply results in an incomplete combustion process. As a bi-product of such incomplete combustion, Carbon Monoxide is released to the WH surrounding area, and this could be deadly for you. The water heater takes its combustion air through the openings around its base (sides and / or underneath the bottom plate). DO NOT block or obstruct any of those combustion air inlets. Keep anything at least 1” away from them. DO NOT store ANY combustible materials (wood, paper, fabrics, etc.) or flammable liquids (paint, paint thinners, aerosol spray, gasoline, etc.) near the water heater. Maintain functional Carbon Monoxide detector(s) and smoke alarms in your home – check Home Safety category for details. That concludes Part 3 of the tank gas water heater maintenance, let me know if you have any questions. If this is where you have started from, make sure that you go over Parts 1 & 2 of water heater maintenance.